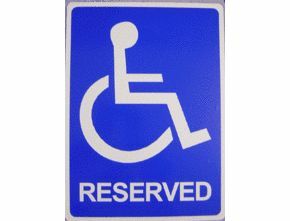 Reserved Sign - Reserved for Disabled Driver Sign. This is a great product and very cost effective. If we have made a number plate incorrectly they are normally 100% scrap, but we have used the rear of the plate (colour coded) and stuck on a 5 year outside vinyl graphic. These plates are designed to be screwed to a wall or a fence, to inform people that this space is for a disabled driver.